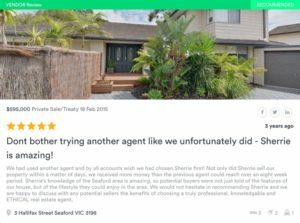 We work with you to get you the "Results that Move You"
Property One Bayside has established a reputation of being a results orientated company with the 2017 winner of the Rate My Agent Award, Director - Sherrie Lee at the helm. The team have been servicing the Melbourne, Bayside community and beyond for well over 20+ years. At Property One Bayside we make it our business to keep a pulse on what is happening within our domain and work hard to apply our invaluable understanding of the market sector. This is why we believe that we achieve the best possible results for our customers. 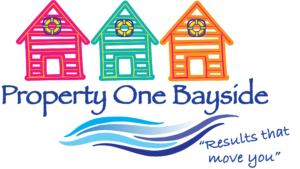 The Property One Bayside philosophy is to aim to obtain the right sale. The careful attention we place to ensuring that both buyers and sellers are getting what they need, is the fundamental reason why we can proudly say that our retention of repeat customers is significant. 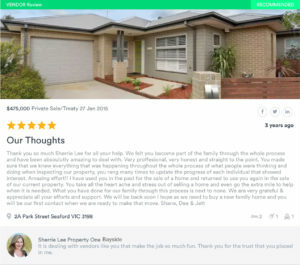 It was a pleasure to purchase our property through Sherrie, very easy to deal with, friendly & clear. Non pressured negotiation a vastly different experience to what we had selling with another agency. 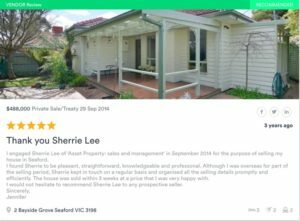 I engaged Sherrie Lee of ‘Asset Property: sales and management’ in September 2014 for the purpose of selling my house in Seaford. I found Sherrie to be pleasant, straightforward, knowledgeable and professonal. 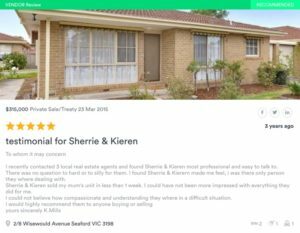 Although I was overseas for part of the selling period, Sherrie kept in touch on a regular basis and organised all the selling details promptly and efficiently. The house was sold within 3 weeks at a price that I was very happy with. 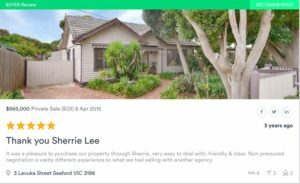 I would not hesitate to recommend Sherrie Lee to any prospective seller.